Like Merchant Ships: Ribbon To The Rescue! I covet ribbon like the tailor of Gloucestershire needs his red twist. With yard sales, you can quickly accumulate spools of beautiful fabric ribbon for pennies on the dollar. I rarely pay more than a quarter a roll. Since I spend so little, I am downright lavish when it comes to wrapping packages. A favorite gift for a little girl is a ribbon streamer: a wooden dowel "wand" with lengths of pretty ribbons knotted through its tip. Magical! Here's another photo from the archives that reminded me of the beauty of ribbons. 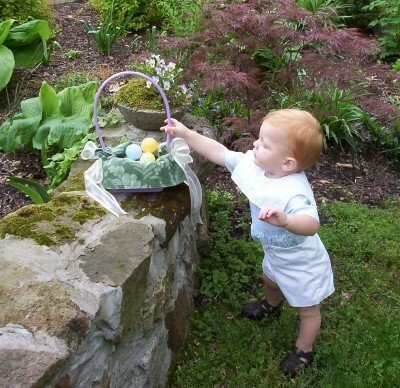 My first Easter as a mom--and I completely forgot that we would need a basket! The only thing I could find in the five minutes before church was a plastic drugstore freebie. I slipped a ferny green placemat inside and folded its edges over to cover the purple sides. Creamy ribbon bows cinched the placemat to the handle with a soft, gauzy effect. Ribbon to the rescue! That sounds like something I'd do -- forget needing a basket for Easter. I love ribbon too. I love to wrap presents with lashings of ribbon.